Pastor Jeffrey Grupp, Church of the Nazarene, Tecumseh, MI, September 2, 2017. For whoever exalts himself will be humbled, and he who humbles himself will be exalted. After about three days of this, I finally paused, amid the busyness of life, and thought to my self, “What is going on here? Why these same verses over and over?” Of course the answer is because I was being tempted with pride, the ultimate sin, and God was warning me. 2. In June I developed, mysteriously, an incredibly painful bump on my arm, seemingly overnight. Just came, seemingly out of nowhere (but later I found out there was far more to it than “chance”). That was a Monday. By Wednesday morning, it was so terrifically painful that it became seriously painful to move my arm or my body in any way without being in hunched-over terror and pain. Despite this, I managed to make it to Wednesday night church, where I listened to the message from our Lead Pastor. In a strange aside, he very briefly talked about a time in his life when he had a boil. I found this somewhat out of character and peculiar, especially since he mentioned it where, he said, it was intended to relate to his message, but it only very loosely did so. I had been praying for an answer to this horrific sore on my arm, and only moments after our Lead Pastor mentioned the boil, I thought to myself, “what are the chances that he would just bring that up!? He’s never brought up anything like that, ever. I bet that was God speaking through him, telling me what I need to know for healing.” And sure enough, I went straight to my computer when I got home, the symptoms of boil were a stunning dead-match, and I had all the information i needed, including what do to for a cure. 3. This morning, my wife and I were reading Oswald Chambers’ Utmost Bible study, and the study was focused on John 7:38. Tonight, my daughter was doing a coloring page from a book that had pictures with Bible verses on it, and she started talking about the verse, it was John 7:38. Do you see where I am going here? Does any of this sound like what you see going on in your life total surrender to Christ? Does it start to seem that, in your life of surrender to Christ, that God is continually steering you by sending you messages, confirmations, signals, and so forth, through the world all around you? For the fully surrendering Christian, who is actively in constant communion with the Creator/Trinity, Jesus will send a continual stream of confirmations, messages, answered prayers, and the like, to the believer to receive, to guide them, steer them, show them which way to go. This can become so ever-present in the watchful ceaselessly praying Christian’s life that reality all-around them will start to function as a message-stream or language-apparatus of God sending messages to the believer/receiver. In simpler terms: God arranges reality before the eyes of the fully surrendering believer/receiver in a way that reality creates a sort of televisual language stream between God and believer/receiver. The depth and piercing nature of this quote has to be meditated upon at length by all. We should not be on autopilot in our ceaseless prayer life, and instead we should be in a state of close empirical and experiential examination of our reality (our self, God, and physical reality—all simultaneously examined), wherein we will notice continual signals and confirmations through and in the world-all-around, direct messages from God, where God orders the world, orders and arranges reality, in a non-random, designed, non-chance, mathematical way (and not necessarily with a mathematics known by or studied by professional mathematicians), where a designed system and stream of events can be observed (if we are watchful in our ceaseless surrender/prayer), where this non-random/non-chance flow of events shows God’s design and reveals Him and what He wants us to know about Him, serving as a sort of linguistic message-stream to us, for us. In simpler terms, what we perceive around us in the physical plane is fully ordered by God (Rom. 8:28, Col. 1:17, Prov. 16:9, etc. ), He wants us to be alert to grasp, absorb, and be catalyzed by the perpetual stream of signals, confirmations, and messages in all we perceive around us, and which He has ordered and/or allowed to exist. This offers a new empirical science of reality for us to be aware of and know reality through, which will be in many ways contrary to the less empirical, and more theoretical “science” that exists in professional academia. And it is a way of seeing (John Wesley called this the “spiritual senses”) that is available to us in our state of lowly Christlike character, where we live in our sub contrario life Imago Dei. 16 Then the Pharisees and Sadducees came, and testing Him asked that He would show them a sign from heaven. 2 He answered and said to them, “When it is evening you say, ‘It will be fair weather, for the sky is red’; 3 and in the morning, ‘It will be foul weather today, for the sky is red and threatening.’ Hypocrites! You know how to discern the face of the sky, but you cannot discern the signs of the times. 4 A wicked and adulterous generation seeks after a sign, and no sign shall be given to it except the sign of the prophet Jonah.” And He left them and departed. So, if we find ourselves seeking, hunting, for these signs, signals, confirmations, and so forth, in order to try to believe God is real, or to try to curb doubt, and so forth, we are completely going about things in a literally backward way, and we are therefore caught in a life of the hypocritical. The aforementioned language-stream from God simply cannot be seen until one surrenders to God fully (and is given what Wesley calls the “spiritual senses”), putting all trust into Him and denying self; this life of constant communication with God is the result of surrender, not the cause to surrender. So, in essence, this perpetual language-stream from the Trinity is not something we can go and see, go and find; rather, it is something that God reveals to us in our restfulness in Him. In other words, the less we do (in the world), and the more we collapse into Him, the more likely we are to become aware of the ordering of reality all around us for communicative purposes that He is creating in order to have conversation with fully surrendered believer/receivers. 2 fixing our eyes on Jesus, the author and perfecter of faith, who for the joy set before Him endured the cross, despising the shame, and has sat down at the right hand of the throne of God.. So, the arrangement of reality around us into a language from God is the result of our faith, it is the product of our steadfast and ceaseless prayer, not a starting point we look for in order to worthlessly attempt to build our faith. Instead, we are to look to God, and be watchful in our prayerfulness, watching ever-presently for the sub contrario way the Lord will reveal Himself to us through the language of the ordering of physical reality. Lord, the earth overflows with your gracious love! Culture is the domain of Satan’s kingdom (2 Cor. 4:4), but Creation is good, is created by God, and is occasionalistically created (ex nihilo) at every instant as the result of God’s infinite love and grace, so we should expect to see clues of His glory and love in the world all around, in the Heavens as well as in the physical plain, once we can see past and through its fallenness via our reckless surrender to Him. God-atonement is the creative Force of Reality. In our moment-to-moment surrender, we decrease and He increases (John 3:3), in accord with Galatians 2:20, where we are instructed to be crucified with Christ, and thus where our non-physical selfhood, our essence, our “me” or “I,” is to literally die, be deleted, and be replaced by the Mind of Christ: He becomes greater, and we become less (again, John 3:30), joy replaced frustration, inner tension is replaced by by deep and thorough inner peace, and the world being seen as undirected chance is replaced by the empirical verification of the world being a language-stream of ordered events between Creator and and believer/receiver–from Trinity to surrendered Christian who is crucified with Christ. Leclerc, Diane, 2010, Discovering Christian Holiness: The Heart of Wesleyan-Holiness Theology, Kansas City: Beacon Hill. Here is a video about the above article, see YouTube link immediately below. For an audio-only (mp3) copy of this video, click here (for the SoundCloud mp3 converter, click here). 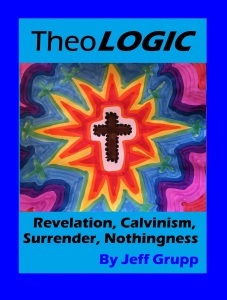 TheoLOGIC: Revelation, Calvinism, Surrender, Nothingness. 17 For if I do this willingly, I have a reward; but if against my will, I have been entrusted with a stewardship. 18 What is my reward then? That when I preach the gospel, I may present the gospel of Christ without charge, that I may not abuse my authority in the gospel.